Which authors were contemporaries of Charles Dickens? Which books, plays, and poems were published during World War II? Who won the Pulitzer Prize in the year you were born? 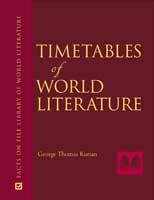 Timetables of World Literature is a chronicle of literature from ancient times through the 20th century. It answers the question "Who wrote what when?" and allows readers to place authors and their works in the context of their times. A chronology of the best in global writing, this valuable resource lists more than 12,000 titles and 9,800 authors, includes all genres of literature from more than 58 countries, and covers 41 languages. It is divided into seven sections, spanning the Classical Age (to 100 CE), the Middle Ages (1001500 CE), and the 16th through the 20th centuries. Comprehensive in scope, Timetables of World Literature provides students, researchers, and browsers with basic facts and a worldwide perspective on literature through time. Four extensive indexes—by author, title, language/nationality, and genre—make research quick and easy. Timelines of key historical events in each century. "...comprehensive in scope...a welcome asset..."
"...this volume can serve as a literary reference source on many levels...an appealing reference source for students. Recommended." "This will be a useful resource for quick facts, recommendations, and research, and for browsing by literature aficionados." "A useful reference source, Timetables is captivating and a bargain...Highly recommended." "This volume is a good resource for high-school, academic, or public libraries, especially where there is an emphasis on world literature."